Marta Danilkovich hails from Minsk in Belarus. She began playing the violin at the age of 6. She enrolled in the Glinka Music College, from 2001 to 2005 where she studied under Professor Zhuk. These studies included music history; different ensemble work such as chamber music, string quartets, conducting and violin repertoire. Marta graduated with a Bachelors degree from the Higher School of music under Professors Kalinovskaya and Fuchs. During her studies at the Higher School of Music, she toured with the student Orchestra of Europe, playing concerts in Lithuania, Latvia, Estonia, Finland and,France. In 2009 she won the top prize with the student quartet at the Oginsky International Chamber Music Competition. She also participated at the festival for young artists in Bayreuth in 2009, whe (...) Mehr anzeigenre she performed concerts with the quartet and orchestra under the baton of Gabriel Feltz. At the same time Marta also played in the Minsk Orchestra ( 2008-2009 Tiroler Festspiele Erl under Gustav Kuhn), in the opera studio orchestra in Minsk. This was followed by a spell in 2010 where she worked at the Institute of Modern Knowledge as the cultural organizer in the educational and creative department of art and production. Together with Vladimir Bodunov, they founded a quartet namely the Pan-quartet. This involved performances with the Ministry of Justice. Performances by the quartet were broadcast on metropolitan television several times.The Pan-quartet played at several notable events such as the opening of the Children's Philharmonic Hall in Minsk and other charitable concerts. In 2013 Marta and her husband moved to work and live in Germany. They were invited to work at the Antagon theater as a musicians and composers. Since 2013 Marta has been active and successful as a freelance performer work in numerous orchestras, also as concertmeister and as leader of the second violins. These performances include: Heidelberger Kantaten Orchester, Neue Philharmonie Frankfurt, die Merck Philharmonie, Philharmonie der Nationen-Justus Franz, Frankfurter Sinfoniker, Russian Chamber Philharmonic of St. Petersburg, PrimArte Orchester, Musikhochschule Trossingen Orchester, Kurorchester Bad Nauheim. Mexico (Mexico-City, Roberto Cantoral Cultural Center, Mexico), Brazil (Rio de Janeiro,Bradesco Theater, São Paulo, Bradesco Theater), Cambridge (King’s College Chapel, UK), Israel (Weizmann Institute of Science, Rehovot, Museum of Art,Tel Aviv)-2015, Deutsche Philharmonie Merck, Oman (Royal Opera House, Muscat, Oman, UAE) -2017, Kurorchester Bad Nauheim. 2015 saw her as a part of the quartet acting in the television series “Hotel Heidelberg”(ARD). “The Violin Drivers” performing their own original music, in the style of progressive crossover metal became the best band in Hessen (2015). 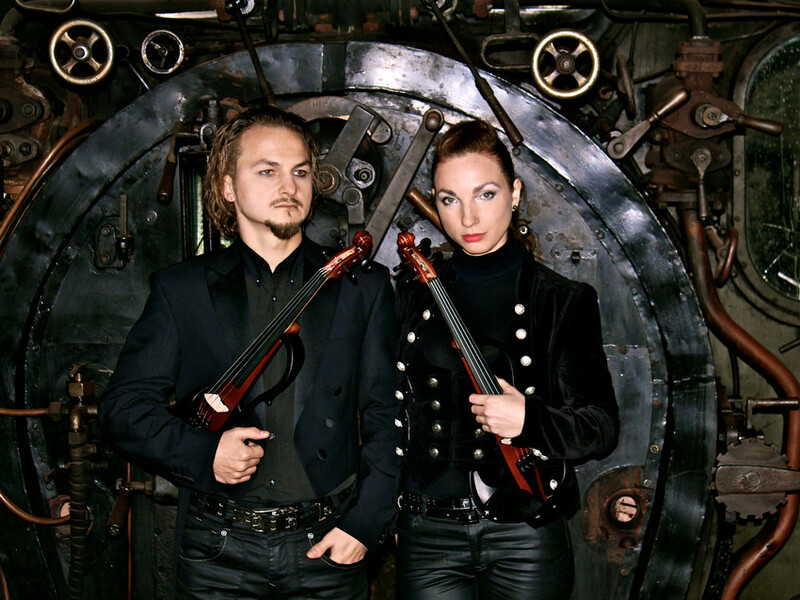 At the moment Marta and Vladimir are working on recording a new album to be released soon. Since 2013 Marta has been part of the La Finesse Streichquartett. With this Quartet Marta have performed at several prominent business events. The corporations include: Maserati Promotion-Tour, Allianz Suisse Sales Awards, Iron Academy, Mc Donalds, Richer & Frenzel, Award "Die Seriale", Sommerempfang des Bayerischen Landtags, Deutscher Innovationspreis, Darmstadtium 2016, Johnson & Johnson, GBTA Conference, Red Dot Award - Konzerthaus Berlin,125 Jahre Niederlassung Metall, Hannover 2015, SAP Firmenevent, Kundenevent Helaba Paris 2015,100 Jahre YASKAWA, Autopräsentation für Porsche u.v.m. Gala concerts include: Stadthalle Aschaffenburg, Schloss Johannisberg, Kurhaus Wiesbaden, Kloster Eberbach, Eltville, Mainfrankensäle Veitshöchheim, Schloss Vollrads, Östrich-Winkel, Kulturhalle Grafenrheinfeld, Konzert Oetker Welt Bielefeld, Hall of Fame Wetzikon (CH), Ansbacher Kammerspiele, Schloss Immenstadt, Kurhaus Badenweiler, Benefizkonzerte Unterfranken für krebskranke Kinder) and others. “I play with pleasure in various musical styles like classic, rock, pop, progressive metal, but clearly distinguishing between each performing style and the manner of playing. Music is an international language of human emotions and experiences, an expression of feelings and thoughts.